Horsham YMCA boss Peter Buckland. Picture by Steve Robards. 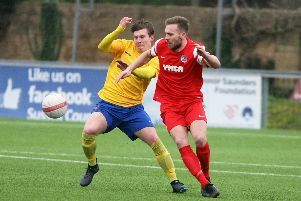 Horsham YMCA boss Peter Buckland believes a second-placed Premier Division finish could be enough to secure promotion to the Bostik League. The manager of the Gorings-Mead outfit is of the opinion that table-topping Chichester City may not be moved in to Bostik South East due to the geographical alignment of the club. The YMCA boss feels the close proximity of Chi to Hampshire could see them placed in the Southern League Division One South if they win the title this season. This would then lead to a second-placed finish being good enough for promotion to the Bostik League. YM are eight-points adrift of Newhaven in second and Buckland is now aiming for that spot in the hopes of realising their ambitions of going up. He said: “I think it’s pretty much who’s going to finish second now. I’m informed that Chichester would be moved over to the west. “I can’t see them putting Chichester in the Bostik South East but they may do. “All we can do is aim for second-place and see if it’s good enough to get us promoted. “Look at the season Leicester had when they won the Premier League. Spurs were home and dry it seemed and they faltered. “It does happen, Liverpool faltered against West Ham and the week before. “However, you’ve got to look after yourself and get your own results. That’s the most important thing. Horsham YMCA host sixth-placed Lingfield in the Premier Division on Saturday. To read more from Buckland on YM's season so far, pick up a copy of this week's West Sussex County Times.